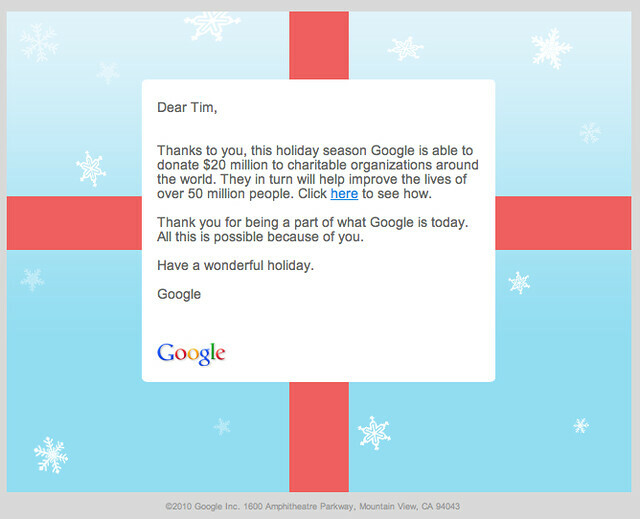 Like last year, Google has just sent out their thank you e-cards saying they have donated $20 million to "charitable organizations around the world. They in turn will help improve the lives of over 50 million people." They thank us for "being a part of what Google is today." And then credit us by saying, "all this is possible because of you." Ending the email with a "Have a wonderful holiday." The email has a link to google.com/landing/thankyou/2010 which demonstrates the charities Google donated to and how it has helped the world. The charities include APC.org, ASHOKA, Bharti Foundation, Connecting Up, Global Strategies for HIV Prevention, LASA, NatureBridge, NPTech, NTEN and UNICEF. Here is the video Google sent out to users, followed by pictures of the email and the video landing page.